It seems to have been my week for things relating to packing up and clearing out, at work and at home. 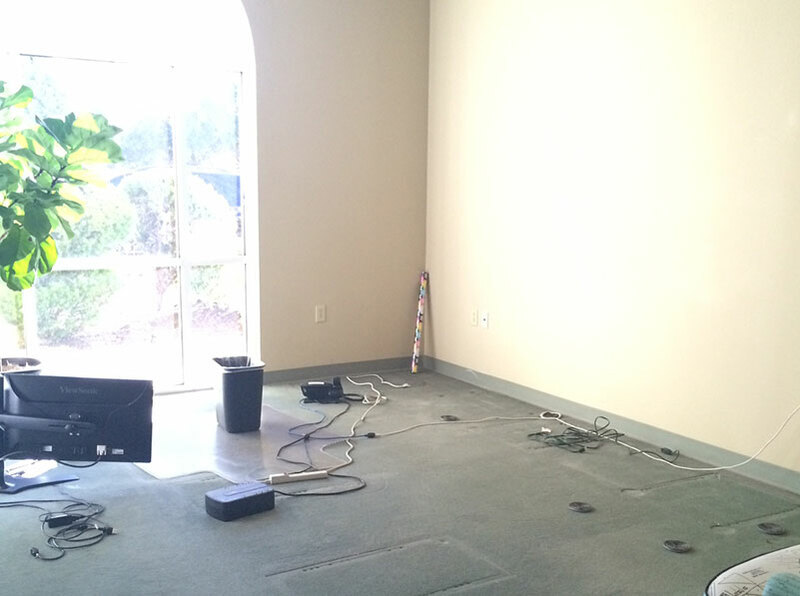 On Monday morning, men arrived to move out the old office furniture in preparation for the planned built-ins. They started by unplugging my computer. Well, alright. I kept busy with anything that didn’t require a desk or computer. I’m also waiting for the desk I’m going to use for my sewing machine to be delivered to my apartment. Because I had a deadline looming, I made do with a portable table. It worked well for the sewing part but not-so-much for the machine-quilting part as things kept vibrating off the edge of the table. That was kind of funny. At work? As the office was being cleared out, I found a box with ½-yard cuts of several collections from Fall Market that were set aside for samples. While I teased about “finders, keepers”, the truth is that as gorgeous as the fabric is, I wasn’t tempted to keep any of it. Okay, maybe just for a moment. The reality is that I have been making changes with my “stash” the past year or so – down-sizing, re-thinking it and changing the “look” of it. Even before I moved, I had been giving fabric to friends and guilds that I knew I would probably never use. Moving just accelerated the process, partly because letting it go was preferable to moving it to a smaller apartment. It isn’t that I didn’t still love every piece of my fabric – or almost every piece. But I had more than I needed – 4 yards when 1/2 yard would have been enough – and there were pieces that I hadn’t pulled off the shelf in several years. Even though it was pretty well-organized, there were times when the amount of it all was overwhelming. The irony is that there were instances when I didn’t have nearly enough of what I was looking for. Just so we’re all on the same page, while the dictionary defines “stash” as a verb, most quilters generally use it as a noun. It’s what we call that collective of lovely fabric we’ve put away for safekeeping or a future use. It can be the subject of curiosity and envy, confusion and frustration. 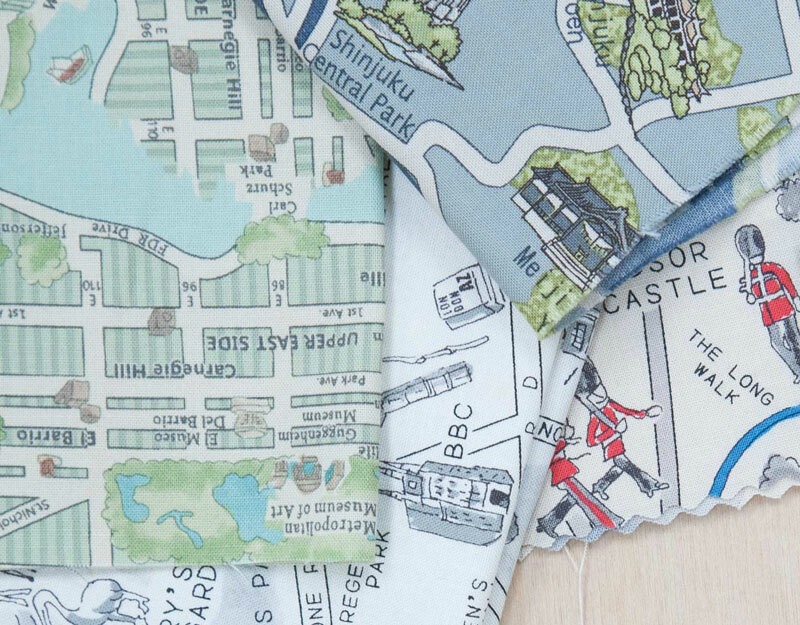 It’s also the question I’m asked most often – how do I know how much to buy of a fabric? The better answer is that it depends on at least seven things I can think of, and that was just in the time it took me to type that sentence. There isn’t a simple, one-size-fits-all formula. If you love scrap quilts, have a lot of storage space, plenty of disposable income, lots of time to sew, make mostly big quilts that use little pieces, fat quarters and/or yardage and you like sewing with several different styles of fabric, then you’ll probably want – and need – a bigger “stash” than someone who makes four miniature quilts a year using only red and gold fabric. If you’ll hang with me for the next couple of months, this is something I’d like to chat about. I’ll share some of the questions I ask myself when I’m trying to decide how much to buy of a fabric I really love, and I’ll tell you the kinds of fabrics I’m always looking to add to my “historical collection”. I’d also like to know if you have a fabric stash. Is it big or small – and do you wish it were bigger or smaller? Are you happy with it? Is there something you wish you knew about buying for your stash? Just so you know, I only buy fabric to keep it preserved for future quilt/fabric historians. It’s my sacred duty to assist future generations in this way. In fact, in honor of National Local Quilt Shop Day, I am going to go to the quilt shop and buy some fabric. I have a fabric addiction, what more can I say. I have a fairly large stash because I live over an hour from the closest source of fabric and sometimes you just need to sew NOW! One problem that I have is that I love several different colorways….civil war, 30s, bright, happy like Lori Holt and B & C lines, muted tones like Fig Tree, and recently, I’ve been drawn to Edyta Sitar’s style of mixing some batiks with prints. Still, though, many times I can’t find exactly what I need in my stash. I have learned to make do and be happy with what I have though. I’m looking forward to hearing more about your stash. I have a good size stash but my tastes have evolved over the years. I have more fabric than I need and some of it no longer appeals to me. My dilemma is how to choose what to keep. Also, how do I decide what to buy for stash-will I love it 10 years from now if it still lingers? And how do I make myself cut into the pieces that I really, really love. I’m so afraid to use that beautiful piece of fabric only to find the “perfect” use for it after it’s gone. Yes! I have the same dilemma with my favourite fabrics! I totally guard my favorite fabrics. I don’t want to “waste” them either. I have almost No stash! I usually just buy fabric for a specific project and hope that I’ve bought enough for finishing it!! I will admit to one stash collection–Gypsy Girl by Lily Ashbury. I’ve been collecting it to decorate my craft rooms with quilty items. Quilting is really two hobbies. One, buying fabric. Two, making stuff. My daughter tells me I’m not a quilter, I’m a fabric collector! She’s right….and wrong! Yes, moda, I love to pet it & look at it. My favorite. I deserve it I tell myself. Yes moda!!!!!! I do not have a near the stash that a lot of quilters have but I think I have a lot. I am mainly a scrap quilter so I mainly collect fat quarters and I save everything – I have boxes of pre-cut squares from scraps to use in scrap quilts. i do have some larger pieces – every thing I have though fits on just a couple shelves in my sewing and two medium size bins full of scraps that I haven’t gotten around to cutting yet. Oh Carrie, along this line of a stash discussion, is there anything you can do to get Moda to put the color number on their Bella Solids. I have yards but I don’t know if it’s snow, white, really white, light ivory, light cream, etc. It’s so hard (for me anyway) to see the difference, they are so close. I only have one batch I was able to pin a paper to with the skew number on it. Here is the frustrating part; I have a friend who recently passed away. I am finishing a quilt she started and try as I might I used a different Bella white then she did. At first I was devastated becuase this quilt means more to me than I can express. So to make a silver lining out of it, I decided the different whites represent our friendship and our lives overlapping. So now I love that this happened. Now if this were to happen under different circumstances, ah, nope would not be so happy. Why oh why can’t they add the skew number to the selvedge for those of us that have snow blindness and are color challenged? Oh, I so love that you are still going to add tales of your move and we are not losing Carrie. Let us know how the job is going. You’re a natural for the Cutting Table. Good Choice Moda! I read somewhere of a quilter who used a sharpie to write the # on the selvage herself. Her black sharpie showed up just fine –at one end of the cut, on the selvage. When using it, cut from the “un-marked” end. Another possibility might be to purchase a Bella Color Card? My stash. If I find a line that I really like I buy every precut type I can find, just in case. Most times I don’t have a pattern in mind so I have to be covered. By the time I actually get to make the quilt, additional fabric will probaby be scarce. I have enough fabric to make 15 quilts right now, but as a full-time working mother and wife I don’t get much sewing done. I was in love with 30’s prints because it reminded me of my grandmother’s quilts. I’ve evolved into more modern prints and then back to replicas. My stash is limited to my storage space, which is now our former TV armoire, and my sewing room is also the play room in the basement. I like my stash, but there is always something new that I fall in love with. Good morning Carrie, lots of “new” in your life to look forward to. Reader’s Digest Condensed Version: In October 2001 I went on the fabric wagon. Although my stash wasn’t nearly the size of some it still took me until October 2014 to actually need some fabric colors. It was a life changing experience as it relates to quilting, and by extension, the way I live my life. My stash would not be considered large by most peoples standards but it seems large to me. I tend to buy when there is a good sale or, as has happened too often where I live, when a quilt shop goes out of business. I’m really trying to use up what I have without buying much more but I get so tempted by the new fabric lines. Now that I have recently retired I hope to do more quilting so I can use up more of my stash. My stash is pretty small said and done. I have a lot of other scrappy types of fabrics I’ve pulled together over freecycle and stuff over the years, but quilting fabric I am actually pretty good at buying when I have a specific project in mind, except as those projects done get done, the stash grows… I was actually just poking through it the other day and I think I need to reorganize it so what I have is more visible. I have a pretty significant fabric stash housed in one 10-foot closet, one 6-foot nine drawer dresser, two large sewing machine cabinets with extra cabinets, one nightstand/storage unit, one nine-cube organizer (on top of the dresser) and on top of a double bed in my studio…my weakness is the unusual or shabby chic that I immediate see a project in – for example, any fabric by Three Sisters…gotta have it. Most Amy Butler fabrics (sorry, Moda), Kaffe Fasset flowers (sorry again) and a lot of Michael Miller collections (final sorry). My core fabric stash does come from Moda designers – and I find myself buying a lot of blenders/neutrals that read a specific colour regardless of who made them — and, of course, interesting text fabrics….love, love, love them. Any discussion you lead on stash, I will be following…although I personally think of myself more as the curator of a large fabric collection, rather than a stash hoarder! Looking forward to seeing the transformation in your “collection” of fabrics! My stash is small when compared to others, but I feel I have too much…until I find something more I like. I like to purchase fat quarter bundles, it makes it easier for me to match colors. So excited for you in your new endeavors. I have a large stash. I have it organized in two different places. In my sewing room closet, I have current fatquarter bundles (released in the past year or two) that I plan to use in upcoming projects. I also keep larger cuts of background and backing fabric on the shelf in the closet where I can see them. The bundles are like closet candy as they are decorative and inspirational. Out in my garage, I have shelving units that hold color or designer coded tubs–“Fig Tree”, “French General”, Civil War reds, Civil War Backgrounds, Light Blues, etc. The way I have these organized, I can use them as an artist uses a paint palette. When I need a certain color I can pull from that stash and give my quilts both a scrappier and a more individualized look. My stash has changed over the past couple of years too. I have tired of few designers and gotten excited about some new ones. I also am using brighter “happier” fabrics in my projects. My stash .. actually I have two stashes (or stashs?) because my mom is nice enough (imagine the sweetest person on earth) to share her stash with me, yeah, lucky me! My mom’s stash is at least twice the size of mine and hands down mine is not small either. I started it in the mid 90ies when I need some fabrics for a school project and my mom started to took quilting classes. Of course, my taste in fabric (not only the colors or designs the quality, too) evolved and there’re a few fabrics I still like but somehow it’s so hard to part with all the others. My solution now is that I’ll use these ‘no more my taste’ fabrics as backings. I really wanna downsize my stash and just have the fabrics I really, really love! How much do I buy? Mmmh, one of my last year’s resolutions were not to buy so much fabric and I’m happy to say I managed this and hope to continue this year (so far no new fabric this year and it’s almost february … I’m proud). Mostly I buy small sizes like FQs or small strips about 20cm (that’s most fabric shops minimum). Some half yard (or more correct half meters) but only when I really love the fabric or have a project in my mind. If I know that I’ll use a certain fabric as background I normally buy 1.5 meters or 2 meters (that also counts for white or off-white solids). And then, of course, precuts my giulty pleasure, I confess:-) Most I love charm packs (small, affordable and instant satisfaction) but there’re also some JRs, LCs and guilty, guilty, guilty, FQ bundles. I started quilting in January 2000. My sister-in-law and I joined our local guild that month ~ I wasn’t sure I knew how to use a sewing machine and had not a clue about quilting ~ except that I loved them! When we heard the term “stash”, we both said, “I’m only going to buy the fabric I need to make the quilt I am working on, because how would you know what to buy otherwise.” However, in April of that year, we went to the AQS show in Paducah and I came home with 23 complete projects to make! Then as we went on shop hops or to other quilt shows with vendors, I bought even more fabric (just in case all the quilt shops went out of business). Then, a friend who was making a move from my city to another city across the country gifted me with all the fabric that she no longer loved and didn’t want to take with her. Luckily for me, my favorite kind of quilts are scrappy. And I love using lots of smaller pieces in large quilts. I’ve never seen a fabric I didn’t like! I am in the final stages of going through my stash and reorganizing it from 20+ clear bins to a 30 cube closet system so that it is easier to get at when I want to work on a project. If you haven’t really gone through your stash in a long while, I strongly suggest it. I ended up donating a lot of material I purchased early in my quilting life and I discovered “favorite” pieces I had forgotten about. I now have a better sense of what I have and realize that I don’t need to go shopping for fabric for quite a while. Of course, I will have to venture out to my favorite quilt shops as soon as a new line comes out that I can’t live without, but I think I will now be better about not buying fabric indiscriminately. Reading through the various comments has been most enjoyable. I fantasize of being organized with my fabric as some writers, admit to having more than I can probably use in my lifetime , and declare that I have no intention of stopping the purchase of more great fabric. I think I agree with Hildy…I’m an addict. My stash is large and I use all of it…the older and newer fabrics….sometimes and often in the same quilt. Other quilts are made from one line of fabric. I want to do it all. My husband says I am a MODA SNOB because I typically buy only Moda fabric. I love it and the designers they have are the best. He knows if I find a quilt shop that carries full lines of Moda fabric, well, we will certainly frequent that shop more than others that don’t. He has been to so many quilt shops with me, bless his heart, that he can now recognize Moda himself just by the feel of the fabric, compared to some of the others. So if the day comes that I have to downsize my stash, the Moda fabric will be the last to go! I have a small stash, even though my husband would disagree. I buy for specific patterned quilts, and have no stash for a scrap quilt at all. I am starting to explore the precut world and patterns, but looking at the stash pictures is just amazing to me. I even worked in fabric stores during my college and early career, about 6 years, and finally finished making a quilt of the last of that fabric just this month. I guess I have something to aspire too!! Love the blog. I have a large stash, but luckily I have the storage room and it is pretty well organized. I have a piece of furniture with drawers and shelves which is where I keep my small scraps separated by color – I also house batting there. The rest of my stash is organized by color and size, also by collection. So all my solids are in one place, organized by color. Collections I don’t want to break up, are in large pullout drawers and kept together by designer. I have a shelf that is just for large cuts (ie: bigger than a yard and used mostly for backs). And then all my other fabrics are organized by color – 1/2 yard to full yard in one area; smaller than 1/2 yard (or what I term “large scraps” in another. It took me awhile to build a stash that makes sense to me – and now I shop from my stash first before buying new fabric for a project. Once a year, I go through my stash and pull out fabric to gift or donate – stuff that I realize I won’t use. Recently I have found that by doing this, I find fabric that I had not known what to do with (but loved it) and now that i have more quilting experience, it is speaking to me more clearly. I have divided my stash…so it doesn’t look as big 😉 well really so I know where the collections are. My novelty habit has been tamed a bit and those collections are stored together so I can make the most of it. What’s funny (as in odd and a little crazy) is that I have a cupboard divided into color ways. This is my oldest fabric. It isn’t necessarily my favorite fabric but I have the hardest time cutting into it…because then it won’t be there anymore ( like I won’t keep adding to it!) Give me brand new fabric meant for a quilt…be it a collection or just random…and I can cut and sew away. The old stuff for some reason gets protected. Oh I have a huge stash but like a lot of folks mentioned, my tastes have changed over time. I still use my 30’s and some favorite designers but some should find a new home where they could be loved and used instead of sitting forlorn in tubs in the garage. I like more saturated colors these days and the occasional quirky piece ( hedgehogs anyone). After a few years of using only white backgrounds I have migrated to using several shades and even a tiny print or two, adds some energy and also a bit of the “make do” vib. I love when some of my favorite Moda designers change their style a bit. Although it’s fun to be able to mix their collections it’s also wonderful to see where their creativity takes them. Think someone like Jean Wells or Alex Anderson, their quilting styles have evolved over time and I think most fabric designers do as well if their manufacturer lets them. Looks like you’re having fun Carrie! Nice to hear from you more often too. I would have loved to raid your stash! 🙂 Mine consists of a variety. I love scrap quilts but have been leaning toward a lot of BOM’s with set colors. Now I really have enough for scrap quilts. Love your blog and am looking forward to following it daily! I think it is difficult to define a stash as “big” or small. As compared to what? I think mine is sort of medium. I collected fabrics like several other commenters because I didn’t live close to or have access to a local quilt shop. Once I’ve moved closer, I find that I’m not buying as much. Like you, I’m finding that my stash is changing. I have a big bin of Thimbleberries fabrics, for instance. I fell in love with them (and I think it was one of the first “collections” that people collected) but I’ve not used them much in the past 3-4 years. Should I move them out? I’m debating about that. (Which means that I want to move them out, but I haven’t yet gotten the nerve to purge them, and I’m usually a huge purger.) I did have a friend once who said that her fabric stash was like her retirement savings. She is putting fabric away now for later when the money may not be as plentiful. I like that idea! Big stash. Big, big stash… and I have GARMENT fabric stashed too. I sew every weekend and I love shopping my stash. I try to limit my big purchases to a couple of times a year, and shop other times only to finish a project. That is HARD because I love the shopping and planning parts of quilting. My tastes have changed over the years, but I like scrappy quilts. I have a philosophy — there are no ugly fabrics, just bad combinations. If you think it’s ugly you didn’t cut it small enough. I belong to two quilt guilds and a family sewing circle and there’s always a place to donate or trade stuff that might not be working with a current project. I store project leftovers and small bits until I get a bagful, then cut these ‘scraps’ into useable sizes and organize them for future projects. That is a real time saver when I need to pull together a kit for the next quilt I want to sew. It’s nice to read a Carrie blog again! Oh, and I agree with Cathy — quilting IS two hobbies! My stash is scrappy and is mainly made up of donations from several fabric fairies. I rarely buy fabric ‘just because’ but if I do it’s a FQ. I buy yardage if I need background fabric for a specific project and usually buy half a metre more than my calculations say, just in case! P.S. I love the idea of having the name/number printed on the selvedge of solids – that would make life so much easier! Hope your new office is modern and fun. Enjoy. As to fabric, my likes and dislikes change with the wind. And, I am not buying as much as I used to until I make some of the projects that have been lingering for a while. But I do definitely purge the stash occasionally. A friend of a friend though recently gifted me with about 10-12 yards of Civil War fabric so I guess I better do something with it. But right now, all I want to work with are brights. I do have quite a bit, but also an hour from any quilt shop, so I either buy when there or have to order. Then seems it’s never what I’m after – if I want all one background, there’s never enough or enough border, or some has been in my stash for eons – so now those are going on backs…….. I’ve started collecting precuts and “some for an inner and outer border …… accck, I might be doing it all wrong, but if I am, I don’t want to be right – I love it all!! I would say at least 85% of it is Moda! I have to admit I am a fabric/kit hoarder…I only hope I can complete the kits I have in this lifetime 🙂 I would love to use up all of my stash before buying another piece of fabric, but I see the new lines and I just have to buy it. Goal this year is to make scrappy quilts using only what I have currently. Love reading what you are up to Carrie, thanks for taking us with you on your journey! 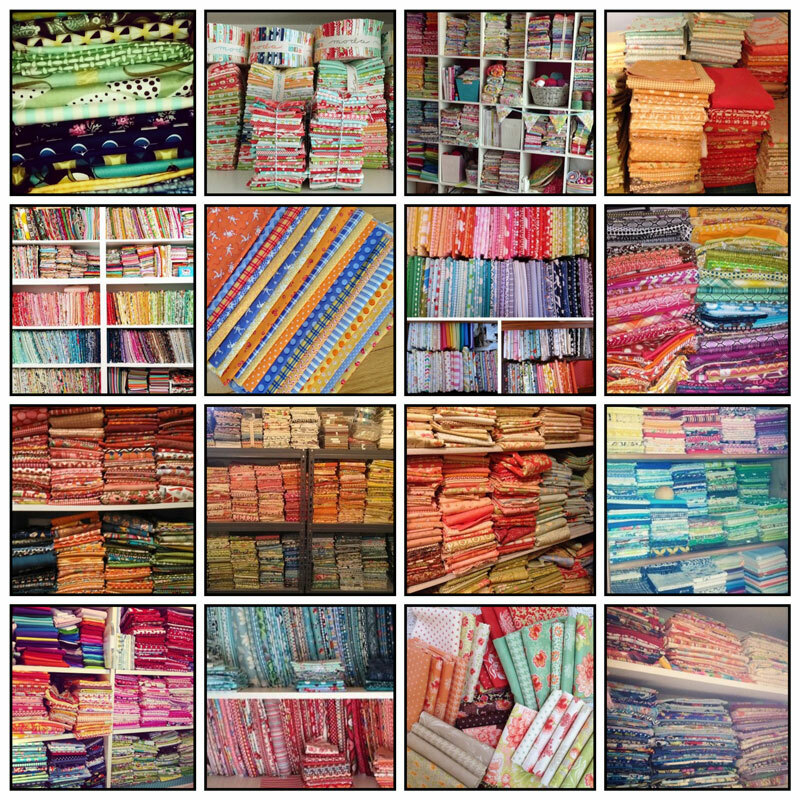 I have a huge stash, could probably start my own fabric store – more than I would need in several lifetimes. I would really like to reduce my stash but don’t even know where to start because I still continue to buy! I have two generations of Stash, one from 10 years ago when I quilted and newbies from when I re-started quilting. I love seeing my old choices and lament not being able to find more of those old prints. This brings me to the “why” of my burgeoning Stash…I worry that a beloved fabric won’t be around when I find a project to call home. I buy more collections so I can have just the right combination when I get around to right quilt for such wonderful fabrics. When I feel guilty for the overflowing shelves I get sneaky and buy just a fat quarter or a charm pack (if I’m really guilty I’ll buy a mini charm). Eventually the scales will balance, then tip, and I will have more UFOs than stash. My stash is … in a word … obscene! To some people, that is. I love every single thread of it and worked hard for the $$ to pay for it. I’m now retired and have the time to sew the things I could only dream of when working. Do I still shop? Sure, I do … to see what is current, what is popular with some age groups and to see if what I have is enough to make a project or if I need to supplement a little to make it an even better quilt. Think I will head upstairs to pet my fabric right now … cuppa tea, good old movie and it’s snowing outside. WHAT better activity for such a day … other than sewing it together?? Hi, Carrie! Happy you got such a plum of a job. I started to quilt in 1986. Yes, I have a sizeable stash. About 1/4 is store purchases – 1/4 for clothing or home decor from store purchases – 1/2 I got while my husband was ill for many years. During the last 5 yrs of that, I had a 1/2-day ‘Mental Health’ day each week. For quite a savings I searched through thrift stores and found a veritable stash of lovely quilt fabrics in many sizes. Would you believe 30 totes – organized by colour and planned quilts. Also 2 metal cupboards w doors that hold all FQ’s and sm yardages of fabric lines and/or ‘special’ fabrics. Now that I am a widow and on a limited budget, these purchases will keep me in fabric and quilting until I am gone. That was my retirement plan. My sons say that I should only buy thread from now on. But – fabric calls to me! What can I do?